These books would work for readers as well as copy work, grammar/spelling/dictation, vocabulary, and more. Each book has several stories in it and we could skip all the grade level readers that seem to last only one child. And those books are what Charlotte Mason called, twaddle: empty learning. A bite of candy now and then does no harm but lets not feed on Star Wars for level 2 readers! I don’t think that it is any secret that I love these book. They are NOT in-depth by any means, but they are beautifully illustrated so that it is easy to copy for our nature notebooks and identify certain aspects of plants, animals, and more. I think they were meant to be coffee table books but I love using them to encourage the children to watercolor and draw. They identify key parts, and then we can do a more in-depth study on it. We have the critically acclaimed book, Anna Comstock’s Handbook of Nature Study, that goes into a lot of detail and information. However, I found that by keeping this more simple, we didn’t zone out with explanations and no visual but a visual with a hunger for more knowledge and understanding that can be found easily online or through your local library. Shakespeare was amazing. And many would argue my decision over a retelling rather than the actual Shakespeare plays. Well, my decision is solely based on the fact that reading plays is difficult for me. I want to SEE plays. I can read re-tellings and understand what is going on. I will read the Shakespear stories, per Lamb, aloud to the children and we will copy out passages from the original works (easily found for free online), and if the opportunity arises, we will go see a play! Again, this also goes back to the fact that Shakespeare is easily found at the library, but I will always choose my favorite retelling of Shakespeare when I am introducing it to the children! Greek Mythology may seem weird coming from me since I am a Christian. However, I find Greek Mythology tells a lot about culture, virtues and morals, and with Greek mythology evil is just black and good is white. There is a lot of research about the advantage to reading mythology to your children, and I agree with it. We read Bible and it stands as our Word of Truth. I love that the key word in this story is MYTH– we do not believe in myths. They are mere stories that were told to explain life. But, as with all things you will have to pray and make this decision for yourself, but I have given you the reason why I would have it on my shelf. 5. The Story of the World by Susan Wise Bauer, Volume 1,Volume 2, Volume 3, and Volume 4. I found that the Well-Trained Mind website has the best price on all four books. These are what I would call a spine. It gives an overview of history, but needs more resources to make it complete. There is some debate about it’s complete accuracy but I find that there is always something in every curriculum that I disagree with. I love to use these books to give us a basic overview and outline and told in a very engaging way. Then we go deeper with more living books and recipes, and art projects, and documentaries, oh my! Because they are shorter is it easier to narrate, dictate, and have some copy work for the elementary and middle grades. For Highschool I would have a different game plan that would involve books like Tocqueville’s Democracy in America and since that would take some time to get through, I would recommend owning over borrowing from the library. If you need highschool resources for history in a minimalist school setting, I think I would have to do a separate post. It was difficult to decide which science book to include until I went back to the core idea which is to present relateable content to a child from a living book. A living book is simply a book where the author is knowledgeable and passionate about what he, or she, wrote about. Jean Henri Fabre was such a great professor at college that his lectures would bring so many students from other classrooms to come to his. There are so many book available in our library about specific things in science, but Fabre wrote this as conversations or stories that Uncle Paul tells three children. This book covers, from one of the top scientists of all times, insects, animals, weather, geology, plant, etc. It is a good introduction into science for the younger grades (ie, elementary and middle). Why am I sharing both Fabre and Herriot? I believe James Herriot did a marvelous job of explaining how animals live and work through his veterinary practice but also brought out a lot of type of personalities that are both humorous and revealing. I guess this would be my version of William Bennett’s Book of Virtues. Our family has fallen head over heals in love with James Herriot. Our children are first introduced to him through his Treasury for Children, but if you were trying to be intentional about your shelves, then I would put the investment out for this rather than the shortened version. I also may be partial to these books because my husband really loves them and has read them aloud to the kids. Bit of nostalgia. But it is still science and moral virtues. You can see if this is the kind of thing that your family would enjoy by checking out the American publication of these books, possibly through your local library. They have the titles: All Creatures Great and Small, All Things Wise and Wonderful, All Things Bright and Beautiful, The Lord God Made Them All. Along with that is the girl’s version. There are a lot of similar ideas in both books but I would encourage owning both. I think I’ll try to incorporate more of this into our weekly home education. I am glad I made this post! In my mind, my bookshelf is taking place. I am not sure what else to add to this shelf of homeschool resources. Do I add some of my own favorites or do I stick to a strict learning for the children and leave the kindle up to me? 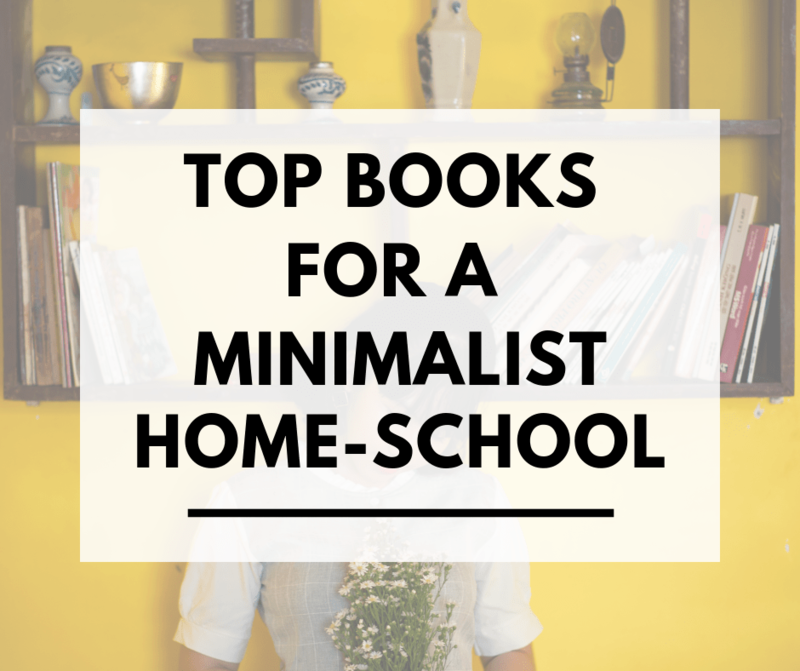 I wasn’t sure what you the reader would like so I ended up coming up with 3 books that I would keep in a minimalist homeschool and I will make another post on that soon. The final book. This was absolutely the hardest book to come up with. I kept thinking of so many books but then another would come to mind and I had to reevaluate my choice. I asked my children, each one gave a different answer: Anne of Green Gables from my 11 year old, Sherlock Holmes from my 10 year old, The Great Brain from my 6 year old, and Little Princess from my 5. The last two suggestions just happen to be the books I am currently reading aloud to them so those are subject to change monthly. I asked my husband who gave some good suggestions… but I would categorize them in a highschool level, which means not at this time. I asked my wise mother, after all most of my book knowledge comes from a childhood of covered bookshelves. She did not disappoint. She made some suggestions which I agreed were fine books indeed. Her no. 1 choice? The Complete Narnia Collection. I am not surprised. I remember saving money up one year and us kids pooling our money so we could get her the audio series, that she still has, and loves, today. Now, Narnia is of course and excellent choice but since I can get it at my local library, I couldn’t justify choosing that one over Little House Series, Or Anne, Or Sherlock, or even Austen! Rangers Apprentice was suggested and pondered. Again, never having read them, not sure I could say for sure it would make it. Then a suggestion was one I was sure I was going to use, The Squire’s Tale series. It is not a popular series so I am not sure it would be readily found, and my husband and I read through them when we were dating! Yes, we were so awesome that we read to each other on dates. However, I still boiled down the fact that I don’t know if I could choose that series out of everything! And then I remembered the books that my children read over and over again. They are brought to the table to amuse during meals. They wake us up from a refreshing night sleep. The have opened the doors to more exploration of ideas economics and other classics. And while The Uncle Eric series are what my kids will read before graduating my homeschool highschool, I love them so much, the Tuttle Twins make a stepping stone toward that. I linked Amazon’s page of the Tuttle Twins, however, you can generally find 40% off codes at various seasons from their website. I kind of explained all the reasons above as to why I ended up sharing these books as my final choice. But, let me add one more thing. A lot of the choices I have shared are a bit heavier. It would have made sense to choose the suggestion my mom gave of the Squires Tale. However, I wanted something that would be a quick and easy read, the atmosphere that I shared above. If all I have in my home is something that is going to require a full concentration and little interruptions, then I think my kids are going to end up walking away from their love of reading. I am not going to turn this into a post of why children need a variety of books in their room to facilitate a love of reading. But I did want to put this caveat out there as to why it may or may not seem like the most amazing choice ever. And, it is still educational so I could classify it as a win in my homeschool shelf! What do you think? Would you agree with these book choices? Do you have any suggestions that other might glean from? Leave your comment in the section down below. Here are a few posts that you might like to read! Here is where I talk about teaching CLEAN art to children! I haven’t heard of most of these books! And I thought I was an avid reader 😂. Thanks for sharing this. I’m going to put these on my Amazon wish list, hah. I love this list! I want to be in your school 🙂 Holly and Kenny read the D’Aularies myth book this year (I have required it now for all six kids) and then they read Percy Jackson afterwards. Thanks for the reminder about the Lamb Shakespeare, I want to have Holly read that this year. I think she’d enjoy it. So, would it be awesome if we could open our own school??? I can’t imagine how hard it was to narrow down to ten! I like your choices! Of course now I’m thinking over what my ten books would be. I may have to steal this idea and put together a list. I don’t know anything about #10, but I do agree that while the Squires Tales are a bit fluffier than some of the other books, they are still “heavy” compared to candy books, so I think you chose well to go a little lighter even still. It was not an easy decision. The Tuttle Twins take classics works like, The Law, Atlas Shrugged, etc and have the twins see how its played out in the world. So they learn capitalism, entrepreneurship, law, and more. I’ll bring them over. Quick reads but still good information.